Hurricane Florence has had devastating impacts in North and South Carolina. 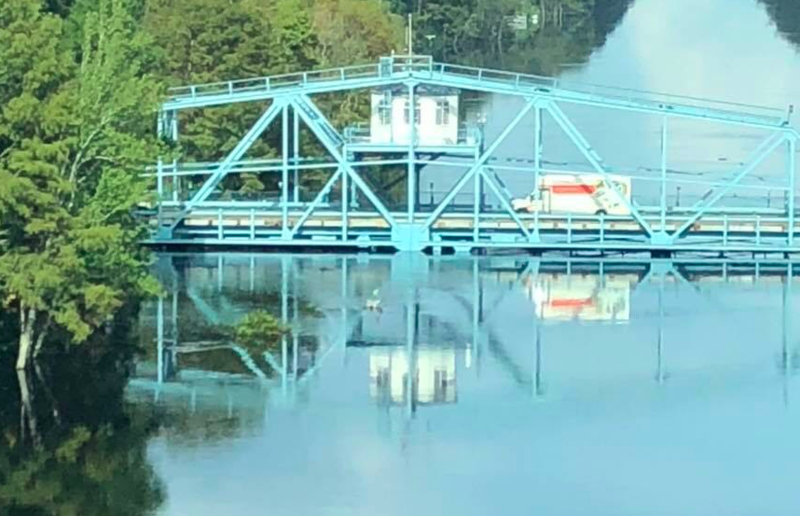 Nearly two weeks after Hurricane Florence made landfall in the Southeast, many communities in North and South Carolina are still evacuated as rivers swollen with rain cause historic flooding and threaten homes, industry, and infrastructure. 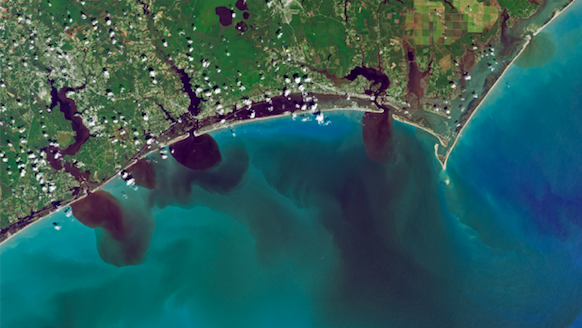 Flood waters not only threaten property and safety, but carry toxic pollution to the coast. Across the region, waste sites containing coal ash and pig manure from concentrated animal feeding operations (CAFOs) have breached and released pollution into storm waters. Meanwhile, rainfall and flooding has caused failures to septic systems and sewage infrastructure, resulting in the release of raw sewage. Surfrider expresses our deepest sympathy for all those who have lost their homes, power, water and other life-sustaining necessities, and to those who are still surviving the aftermath. It's important to note that while some are in recovery mode, others are still in response mode. Below is some local information from our chapters in impacted areas. Myrtle Beach (the Grand Strand area), SC - Although spared the brunt of the immediate damage caused by Florence, parts of the Grand Strand are still evacuated and actively evacuating, as record flooding is occurring. The flooding is far worse than anyone anticipated and peak flood stages have not yet been reached. Large sections of Conway, Socastee, St. James, and Georgetown are already under water. The U.S. Army Corps of Engineers is working to keep key highway bridges open. Recovery is expected to take weeks, and families may be without homes and lack basic necessities for months to come. Leaders of the Grand Strand Chapter are in response mode, working to serve food to hundreds of evacuees and bag sand to divert flood waters and protect homes. Chapter leaders have advised that SCNeedsHelp is accepting donation of goods to distribute to displaced community members - please see their page for a list of needed items and an address. Cape Fear (greater Wilmington), NC - Hurricane Florence made landfall at Wrightsville Beach, inundating coastal areas and inland to Wilmington, causing serious damage to structures, fallen trees, and flooding. Some areas are still experiencing inundation. Residents are in recovery mode, although schools and many businesses have not reopened. 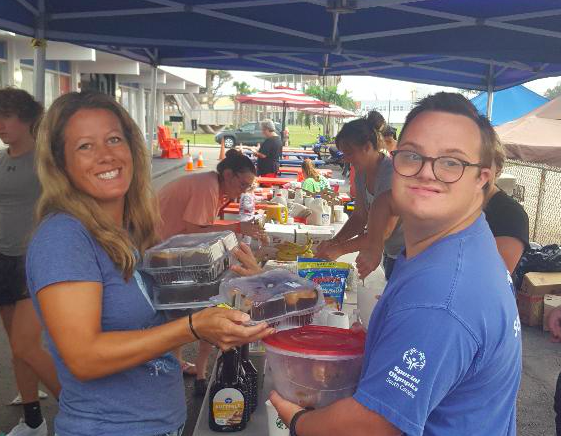 The Cape Fear Chapter held a beach cleanup at Wrightsville Beach on September 23rd. Over 150 people came out to participate and they collected hundreds of pounds of debris (mostly plastic) along the entire length of the beach. The chapter is organizing a boat-assisted cleanup on Sunday, September 30 on Lea/Hutaff Island in conjunction with Plastic Ocean Project and Sea Turtle Project. It is reportedly a mess with plastic flotsam! Bogue Banks, NC - Piers in Carteret County were damaged, and beaches experienced considerable erosion. Homes experienced substantial flooding, and a number of septic systems have failed. Residents are in active recovery mode. The Bogue Banks Chapter is planning a beach cleanup for next Monday evening - stay tuned here for the time and location. Locals are encouraged to come out and support! Stormwater and flood advisories remain in effect for all affected areas and authorities are warning people to stay out of the water. See flood updates and beach advisories posted online for North Carolina and South Carolina. A New Normal for the Atlantic Coast? Just shy of two years ago, some of these same areas were hit by Hurricane Matthew, and have still not fully recovered. Last year about this time, Charleston received record storm surge from Hurricane Irma. Stronger and more frequent storms are becoming the new norm for people living along the coast, placing lives in danger not just from the immediate impacts of wind and storm surge, but also from the more prolonged impacts of flooding and pollution. Unfortunately, public policy is not keeping up with the need for adaptation to present day conditions. Case in point: North Carolina hog farms were impacted heavily back in 1999 by Hurricane Floyd when 46 hog waste lagoons were breached and an estimated 110,000 hogs perished. Some action was taken by the state to prevent new lagoons from being established, but the existing threats remained unaddressed. Hurricane Florence, nearly 20 years later, has similarly impacted commercial hog operations, causing nearly 40 lagoons to flood releasing manure into floodwaters. Additionally, North Carolina legislators barred state officials in 2012 from using a then-current sea-level rise report produced by the state's Coastal Resources Commission to inform state coastal management strategy, and instead directed the Commission to produce a report with a shorter time horizon and reduced rates of sea level rise, basically ensuring a failure to be prepared for long-term effects of climate change. There is also failure by the federal government, under President Trump's Administration, to take action to lessen the impact of these increasingly devastating coastal storms. Efforts instead are being put into scaling back environmental protections, defunding important programs that support coastal resiliency and refusing to even admit that climate change is real. Take for instance, the flurry of Executive Orders and bills that were signed as President Trump came into office in January 2017, which repealed many important environmental and public health safeguards - including the Stream Protection Rule aimed at keeping discharges from coal mining operations out of nearby streams! The Environmental Protection Agency (EPA) is also leading efforts to repeal, replace or modify protective regulations that the administration considers too costly and burdensome for the regulated industry. More on this here. Even now, a Congressional committee is haggling over which policy riders to tack onto a spending bill for the EPA and Department of Interior. One gives exemptions to CAFOs from meeting Clean Water and Clean Air Act regulations and another repeals the Clean Water Rule that protects nearly 20 million acres of wetlands and two million miles of streams - now that is a lot of insurance against flooding that we are literally walking away from. And let's not forget that the United States is the only Western democracy refusing to sign the Paris Climate Agreement meant to curb carbon emissions and lessen the impacts of climate change. Some of the states most affected by climate change also have their heads in the sand and are not proactively implementing climate change adaptation measures to deal with increased storms and sea level rise. This is why the work that the Surfrider Foundation does to urge our officials at the federal, state and local levels to protect clean water and resilient coasts is so important. We are fighting against environmental rollbacks and asking Congress to Stand up for Clean Water. We are working with the #WeAreStillIn coalition by urging the Trump Administration to honor the Paris Agreement. At the local level, our Surfrider Chapters are running Ocean Friendly Garden programs to transform landscapes to soak up stormwater and capture and store greenhouse gases. 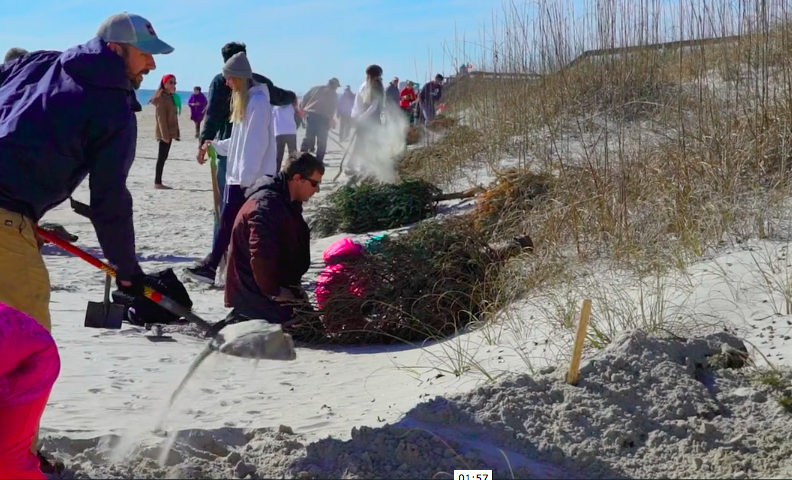 Chapters also conduct restoration projects that make our coastlines more resilient such as dune plantings and the widely popular Christmas Tree recycling program in North Carolina. But there is much more to do! Stay safe at the beach: Don't be lured into the water by enticing swell after storms or heavy rain bring polluted water to the beach. The health risks from swimming in sewage and contaminated stormwater are real! Be mindful of beach advisories, but note that officials may not be actively testing the water or posting advisories as water quality monitoring programs can be interupted by severe weather during hurricanes and flooding events. Join Surfrider: Join us in support of our chapters in the Southeast as they fight for clean water and help their communities become more resilient in the face of climate change. Become a member of the Surfrider Foundation here.